Located slightly south of Eldorado, New Mexico, the Highway 285 community in the Santa Fe, New Mexico, area is a wonderful place to call home. This community is comprised of gorgeous single-family homes and estates, and available properties in the Highway 285 community also include land plots and acreage. The homes in the area encompass a wide variety of distinct styles and sizes, but they are all equally lovely. There are many wonderful options to consider, so you are sure to find something in this community that will pique your interest. When you choose to live in this community, enjoyable entertainment options will surround you. 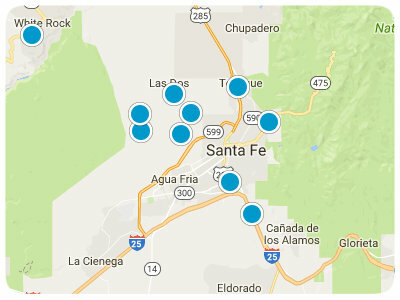 For example, Highway 285 runs north to south, so you can easily access everything the Santa Fe metropolitan area has to offer. This dynamic city is known as an arts hub, and you will have many chances to discover impressive artwork, attend captivating live performances, and tour interesting museums. Envision spending an evening at the Santa Fe Opera enjoying a world-class performance or passing some time at the famed New Mexico Museum of Art. Annual local festivals and the Santa Fe Farmers Market are only a couple examples of other attractions in this city. When you are ready to spend time in nature, look no further than the Santa Fe National Forest. There will always be something for you to discover in this majestic area that is full of natural beauty. Envision exhilarating hikes, invigorating strolls, and picnic lunches with stupendous views. These attractions can easily become part of your everyday life when you are a resident of the Highway 285 community. No matter where your adventures lead you, you will be content to think of your fabulous single-family home or estate awaiting your return. Homes for sale in the Highway 285, Santa Fe, community are ready to impress you with their great location, stunning beauty, and impressive surroundings. When you are a resident of this welcoming community, you will value these attractions. If you are ready for more information regarding Highway 285, Santa Fe, real estate options, please do not hesitate to contact us.